HOUSTON, Texas -- With each stinging line drive, Jose Altuve is putting his stamp on this October. Same with every pitch from Justin Verlander, no matter the inning or score. Houston's longest tenured player and its durable new ace - an incomparable pair so far this postseason. 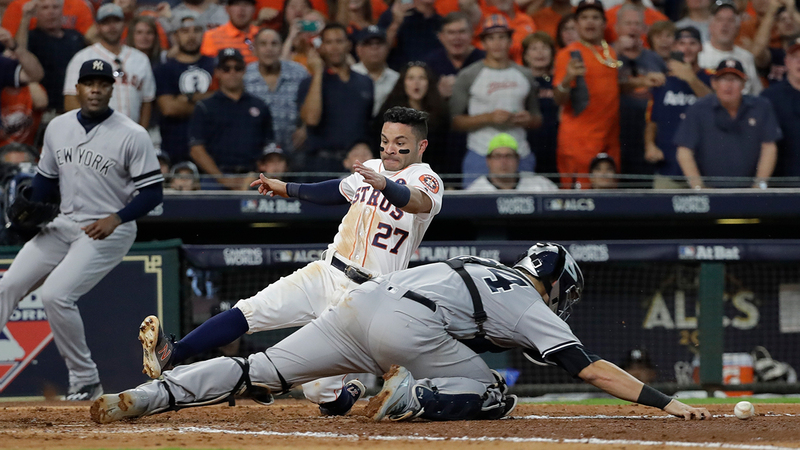 Altuve raced home on Carlos Correa's double in the ninth inning, Verlander struck out 13 in a complete game and the Astros beat the New York Yankees 2-1 Saturday for a 2-0 lead in the AL Championship Series. Sanchez misplayed a short-hop, allowing Houston's dynamo second baseman to slide past safely. "When I saw him running I was like, 'Oh God,'" Correa said. "And then obviously he beat it out." Altuve had two more hits and is 13 for 23 (.565) this postseason after hitting just 4 for 26 (.154) in the 2015 playoffs. "He's unbelievable," Verlander said. "The guy does everything." Verlander improved to 8-0 in eight appearances with Houston since agreeing to an Aug. 31 trade from the Tigers, including his Game 4 win in relief during a Division Series against Boston. He has a 2.04 ERA over a postseason-leading 17 2/3 innings. "When I decided to say yes, these are the moments that you envision," Verlander said of agreeing to the trade. "You don't envision going 5-0 in the regular season once you get here, that's all fine and great, but that's not why I was brought here. I was brought here to help this team win a championship." Verlander set a postseason career best for strikeouts and allowed five hits in his second career complete game in the playoffs. He threw a season-high 124 pitches and retired baby Bronx Bombers Aaron Judge, Sanchez and Greg Bird in the top of the ninth. "This is such a big moment for our team, but he put us on his back today with his pitching," manager A.J. Hinch said. Dallas Keuchel won Game 1 for the Astros - also 2-1 - pairing with Verlander to give the Astros perhaps the best 1-2 punch in these playoffs. "That was one of the most impressive things I've seen in my professional career for sure," Keuchel said. "But that's why we got him - for his postseason pedigree." In the bottom of the ninth, Judge picked up Correa's hit in right field and threw toward second base. Gregorius fielded there, and his throw beat Altuve to the plate by a few steps. Sanchez just couldn't squeeze the one-hopper. "That's a play I'm used to making," Sanchez said through a translator. "Really thought I had a chance at making that play there. Unfortunately I dropped the ball and couldn't make that play." The Astros mobbed Correa in shallow center field while Altuve pointed and smiled from near home plate. Houston took its first ever 2-0 lead in a Championship Series in front of a crowd of 43,193 which included Houston Rockets stars James Harden, Chris Paul and Trevor Ariza in front-row seats. Minute Maid Park buzzed throughout, and fans let out huge cheer when Hinch sent Verlander back out to pitch the ninth. "No words were necessary," Verlander said. "It was my game to win or lose." Verlander got the first complete game by any pitcher this reliever-heavy postseason and his first nine-inning outing since his Tigers beat the Astros 3-2 on July 30, 2016. This was the seventh time Verlander had 10 or more strikeouts in the postseason, extending his major league record, and his seventh postseason game with 120 pitches or more. The unshakable right-hander struck out the side in the eighth, and television shots showed fiancée Kate Upton in a pink sequined shirt cheering and clapping wildly as he walked off. Verlander, Keuchel and two relievers have combined to strike out 27 Yankees in the series. "They're making pitches on these kids," New York manager Joe Girardi said. "And maybe are they trying a little bit too hard? Yeah, of course. But I think everyone out there's probably trying a little bit too hard." Correa's homer in the fourth off starter Luis Severino sailed just out of reach of Judge and 12-year-old Carson Riley, who was sitting in the front row in right field. The ball bounced off Riley's glove and into the stands, and Girardi asked for a video review to check for fan interference. Umpires upheld the call. Riley hopes to get the ball signed by Correa and called the moment: "A really cool one." It was reminiscent of a homer by Derek Jeter in Game 1 of the 1996 ALCS between the Yankees and Orioles. A 12-year-old Jeffrey Maier reached out and deflected Jeter's hit into the stands, but umpires ruled it a home run. The 23-year-old Correa is the fifth player ever with five home runs in the postseason before turning 24. Todd Frazier drove in New York's run with a ground-rule double in the fifth when his shot to left-center got stuck in the chain-link fence protecting the visitors' bullpen. Center fielder George Springer tossed his glove in the air several times attempting to knock the ball loose, but never got close. Severino allowed two hits and a run in four innings. He was hit by a comebacker from Yuli Gurriel on the last out of the fourth, and Girardi said they lifted him as a precaution. Tommy Kahnle and David Robertson threw two scoreless innings each for New York before Chapman allowed his first run in 18 2/3 innings. Verlander got out of the third inning unscathed thanks to two big defensive plays. The first came when Josh Reddick made a leaping catch before crashing into the low wall in right field to rob Chase Headley of a hit for the second out of the inning. Verlander raised his right fist into the air after the catch before pounding it into his glove several times to acknowledge Reddick's work. Brett Gardner followed with a rip to the corner of right field, but was thrown out trying to stretch it into a triple. Reddick threw it to Correa, whose one-hop to third base was just in time for Alex Bregman to tag Gardner out. He was initially ruled safe, but Bregman was so confident in his tag that he walked off the field as soon as the play was done. Hinch challenged, and it was quickly overturned. Yankees: CC Sabathia will start Game 3 on Monday in New York. It will be his third start this postseason and 21st career playoff start. The 37-year-old lefty allowed eight hits and six runs - four earned - with 14 strikeouts across 9 2/3 innings in two starts in the ALDS. Astros: Charlie Morton is scheduled to pitch for Houston in Game 3. He allowed seven hits and two runs in 4 1/3 innings of Houston's 5-4 win over the Red Sox in Game 4 of the ALDS.